Wow. It’s only March, and so much has happened this year already! I will do my best to catch you up in another post, but this…THIS post involves food. As an attempt to motivate myself to be consistent in my blogging, I have decided to introduce a weekly post called Meal Planning Monday. This is not to be confused with Meal Prep-I mean, who really has time for that, anyway? Okay, lots of people do, I’m aware. But I definitely do not, so this is my alternative. When I was in the last stretch of pregnancy, it was really hard for me to refrain from eating out (my guilty pleasures were Taco Bell and Costco Pizza). My stomach and my heart said YES to all foods fast and easy, but my wallet said NO! PLEASE STOP!! Let’s face it: when you’re 9 months pregnant and really hungry, you don’t think very clearly. Like, at all. You want food, but you don’t necessarily want to make said food. So. I had to do something differently, or I was going to lose control. And money. Lots and lots of money. My conclusion was to write out a weekly menu at the beginning of each week. This not only would prevent me from eating out so much, but it would be a great resource to turn to when I would be hungry and want an idea of what I could eat for dinner. The icing on the cake (do all pregnant women love cake as much as I did?!?!) was that writing out a menu each week would also help prevent much food waste. I would write the menu based solely on what was in the kitchen, and that way produce was always accounted for before spoiling and I didn’t have to wonder if I had the ingredients to make what was for dinner that night. My plan is to present to you, each Monday, with the previous week’s menu and our favorite recipe from the week. I love to experiment in the kitchen, so a lot of times I am not using a recipe…but I will do my best to write everything down! I also love Pinterest, so I will likely be sharing quite a few recipes and inspirations from there. 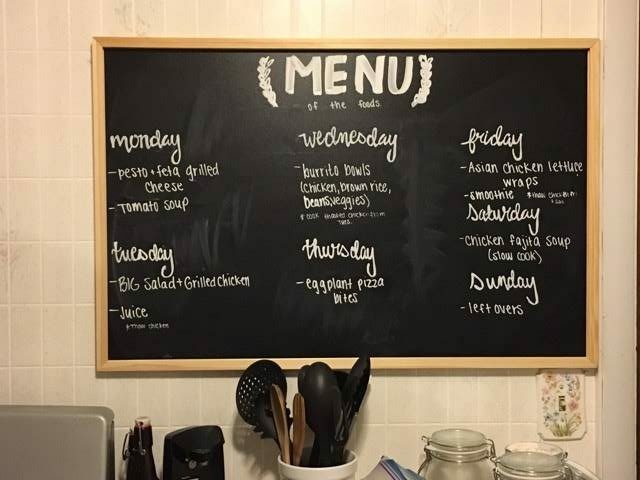 So, if you are looking for a way to plan ahead for dinners (or any meals, really), a solution for high food waste, and a way to prevent you from eating out as much, try writing out a weekly menu with me! As we plan menus each week, this would be a great place to share recipes and tips! Here is a previous menu, with dinners planned out for each day. Try to include at least one day of leftovers-preferably a day after you know you will be having left over dinner-so that the leftovers are not going to waste either! Use tally marks or another way of keeping notes to track which recipes are popular and successful in your household, and which recipes are not. If you have kids, having them each pick a meal for a specific day would be a great way to get them involved and excited for dinners! 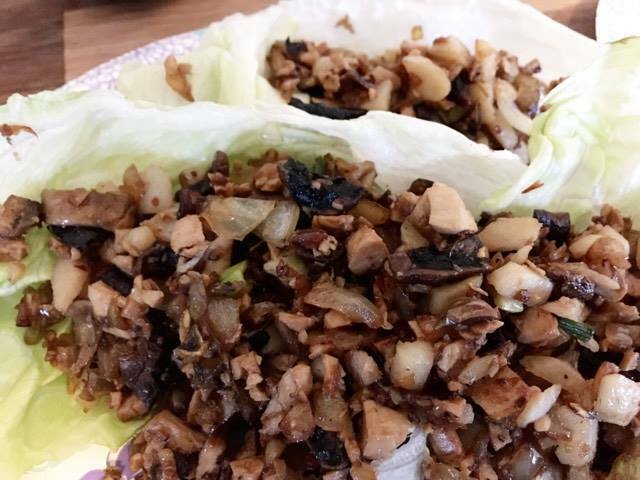 This week’s favorite meal was the Asian Chicken Lettuce Wraps (Friday’s meal). The recipe for this meal was inspired by a recipe by Cooking Classy, found on Pinterest. It was originally intended to be a slow-cooker recipe, but I honestly forgot about that and had to cook it on the stove. Place ground chicken and garlic in a large microwave safe bowl. Microwave mixture, stirring occasionally, until chicken is no longer pink, about 5 – 6 minutes. Drain off liquid and pour mixture into a 5 – 7 quart slow cooker. Add bell pepper, onion, hoisin sauce, soy sauce, 1/2 tsp salt and 1/2 tsp pepper and toss mixture. Cover and cook on low heat 2 – 3 hours until chicken is tender. Stir in water chestnuts, cooked rice, green onions, rice vinegar, and sesame oil, cook until heated through 3 – 5 minutes. Season with additional salt as desired. 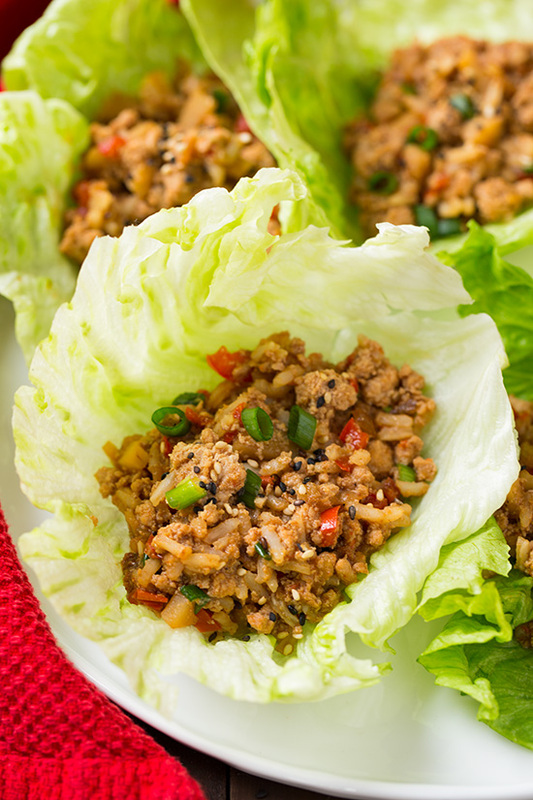 Separate iceberg lettuce leaves and serve with chicken filling. I’m sure this is a fantastic recipe, but I did change a few things (experimenting, as usual). For the most part, I used a lot of the ingredients listed in the Cooking Classy Recipe, but I substituted and added some as well. And, obviously, the directions were different as I used the stove top rather than a slow cooker. Here are the modifications that I made to the recipe and directions, as well as the ingredients I kept the same. Cook the meat/tofu over medium heat in a pan with sesame oil until browned. Add veggies and water chestnuts into the meat and cover in order to steam. Once mushrooms and onions are soft, uncover the mixture and add remaining ingredients. Spoon mixture into lettuce, wrap, and enjoy! This recipe can certainly be modified in many ways, and can be cooked slowly or on a stove top and still have great, tasty results. The flavor in this recipe is to die for! We loved it so much, that we used the same ingredients and added them to some noodles for chow mein the next week! This can be such a diverse recipe that can be made spicy or mild depending on the desire of each person eating it, and can certainly be allergy friendly! I hope you enjoyed this week’s Meal Planning Monday recipe! Please feel free to share your favorite recipes, tips, and experiences from your meal and menu planning!